Tired of those unwanted scents lingering in your home or office? From dry or steam cleaning to air purification, our company’s technicians have the knowledge and tools needed to get rid of tough to remove odors, making your life easier, and fresher. When it comes to those lingering odors, there are many factors at play. The most common reason for those unwanted smells is pet urine—often from cats and dogs. Cigarette smoke, mold, and accumulated dirt and grime from food products are other common culprits. As much as it helps, baking soda isn’t a permanent solution. Our company offers commercial and residential odor removal services. Our qualified technicians have the expertise and equipment necessary to properly, and completely, remove unwanted odors found in carpets, rugs, and upholstery, and other places. Regardless of how much effort you put into maintaining your carpets and upholstery, years of dirt and grime accumulating inside the fabric are bound to cause unwanted odors. Our company offers a choice of dry or steam cleaning services, depending on what you require. While the term may be called dry, both carpet cleaning methods use water to a varying degree. If you want dirt to be removed quickly and efficiently, dry cleaning may be the appropriate choice. 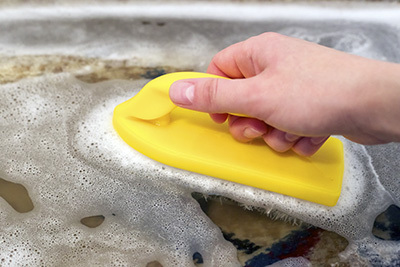 It offers close to no drying time by using a pre-cleaning agent and vacuum. Steam cleaning, while more time-consuming and laborious, is a powerful solution when it comes to cleaning a stinky carpet. When using a detergent and a professional carpet steam cleaner, soiled carpets are cleaned thoroughly and may be more effective at removing dirt and grime thanks to the application of hot water and high pressure. While treating the source of unwanted odors is an obvious way to remedy the problem, it doesn’t necessarily factor in pre-existing odors found within your commercial or residential space. Airborne residue such as pollen, pet dander, smoke, and mold can still exist, and float around the room. Opening the windows isn’t the proper solution. Our odor removal services can assist you with the purification of ambient air. By hiring us, we can ensure that your home will not only be spotless and fresh, but also safe from any harmful bacteria, chemicals, and allergens threatening you. Make your home or office smells fresh and clean. Carpet Cleaning Lake Forest offers professional, effective odor removal and other cleaning services. Contact us now for your residential or commercial cleaning needs.